What is the linking point between you and your weights? For the vast majority, it is your hands. In many instances amateur bodybuilders and athletes forget about the only thing that separates them from their weights. Consequently, their hands and grip strength gets left behind, even when their biceps reach gargantuan proportions. If you ever found yourself struggling to lift a weight, simply because you cannot physically hold it, then this article is for you! It’s true that many gym exercises do not require an iron grip, but one of the best compound exercises is the deadlift, and that sure as hell needs a strong grip. Moving away from the gym, many sports place a strong emphasis on grip strength. These include powerlifting, strongman events, tennis, rock climbing, wrestling, gymnastics, baseball, cricket, and various forms of football. 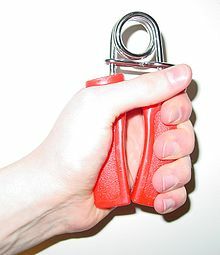 In fact, there are now actual competitions that are centred around grip strength. Moving away from sports, even certain careers require strong grips. These include many trades like carpentry, plumbing, mechanics, and pretty much anything that requires use of your hands. In more extreme cases for certain individuals, such as the military and police force, grip strength could be a matter of life and death. So regardless of your situation, it’s likely that grip strength is something worth training. Other than having applications across many disciplines, let’s not forget that grip strength has extremely practical day to day applications. Let me ask you this, what’s the point of being able to bench press 200 kg if you can’t open a pickle jar? Also important is that grip strength naturally declines with age (Mathiowetz et al, 1985). It is therefore even more important for the more senior individuals to train grip strength to ensure they have improved quality of life. Lifting with a thick bar for deadlifts and pull-ups: Gripping a larger bar is more difficult, and will train your grip strength. Using high quality grippers: These are specifically designed so you can train your crushing strength (ie. force of bringing your four fingers inwards into your palm(. Pinching and holding weight plates: Doing this will increase your pinching strength (ie. force of bringing your thumb towards your other fingers). Wrist curls: Much like regular curls, but only articulating at your wrists, this will increase your forearm and grip strength. Farmer's walk: A popular strongman and CrossFit exercise, you hold heavy weights with both hands at your sides and...just walk. Extending your fingers using purpose made high resistance rubber bands. Reverse wrist curls: Much like regular wrist curls, but with palms facing down. Regardless of how strong your grip is, when it comes to very heavy weights, it is important to keep your hands very dry. The slightest bit of sweat can make it extremely difficult to hold a bar securely. It is sometimes a good idea to invest in some gym chalk. This will keep your hands dry, provide extra grip, and reduce friction. As mentioned above, it’s no doubt that many athletes do require strong grip strength. However, if you are focused only on bodybuilding, and you’re dead-set with not doing any form of hand training, then there is a way to get around it. Using wrist straps will take part of the strain of the weight out of your hand and onto your wrist. This allows you to lift a weight that you would otherwise not be able to grip.